This is called a “volute krater” because the handles on either side are very similar to the volutes that are found in architecture. It’s also called a krater because it was used as a large bowl to mix wine and water together in. Look back at the beginning of this chapter and you’ll see the different shapes. The reason why the formal elements of this vase are important is basically because it becomes more realistic than earlier pottery we’ve looked at. The vase that represented Polyphemus although it’s orientalized and the figures are outlines and are fairly realistic it doesn’t represent a high degree of naturalism. In this vase the figures are little bit more lifelike and defined more clearly. Most of the figures are almost silhouettes that are done in what’s called “black figure style.” The black figure style is a style of representing the human form in which the artist completely paints a silhouette of the figure in dark glaze and then etches away with a sharp needle the details of the figure. In this black figure style vase some of the figures have faces that are glazed with a lighter color glaze than the clay is. However, a majority of the figures are represented in complete black figure. The other formal qualities that are important about this vase are that the vase is much busier and has many more frets or bands to it than the earlier vase representing the blinding of Polythemus. In fact it’s packed with more than 200 figures. ) exhibits “ horror vacui” but does not contain the rosettes and ornaments of the Orientalizing period. Another interesting innovation is the introduction of the written word into vase painting. Interspersed between all of the figures almost like labels in a comic book are the names and titles of the different characters represented on the vase. You’ve probably seen or heard the phrase “in Vino Veritas” kicked around on TV and in film. It’s just Latin for the phrase “in wine is truth.” While I have some friends who when they drink too much wine tend to act half assed. Isn’t this the description of a centaur. Half the animal, and notice it’s the bottom half, runs away with the centaurs when they get drunk. They are literally thinking with their bottom halves. So the centaur kind of represents the battle in all of us when we’ve had too much to drink in which are animal nature gets hold of us and makes us not thoughtful. 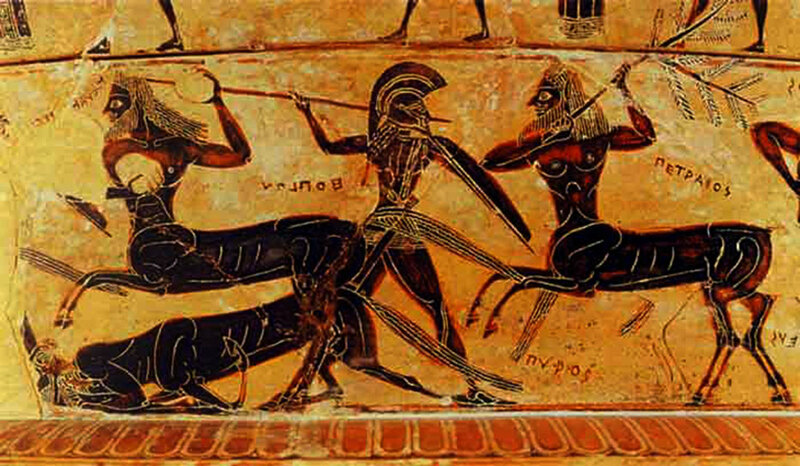 There are many theories concerning representations of centaurs as being symbolic of representing the Greeks’ enemies. For example, we will be studying the Parthenon built around 450 BCE. 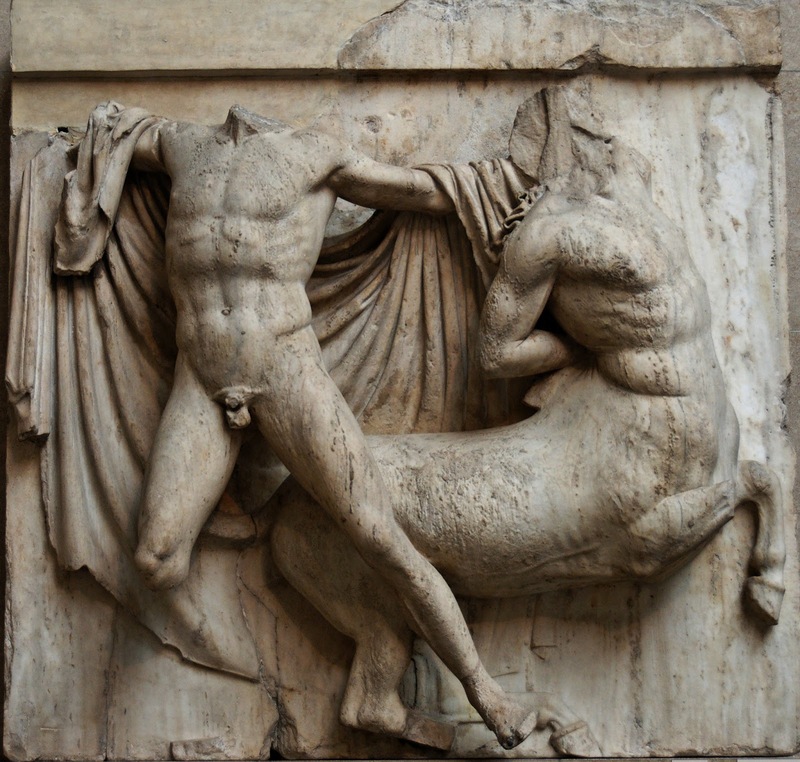 There are rows of relief sculptures called metopes in the entablature, the topmost portion of the building above the columns, that represent Centaurs fighting Lapiths. 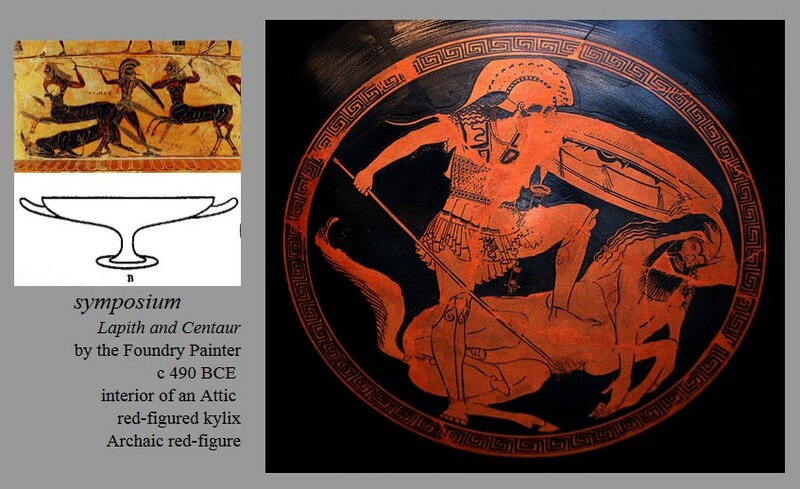 One interpretation of the centaur is that it represents the Apollonian Dionysian conflict but some scholars believe that these representations are of the Persians who the Athenians just defeated. A safe interpretation is that it’s probably a little bit of both.